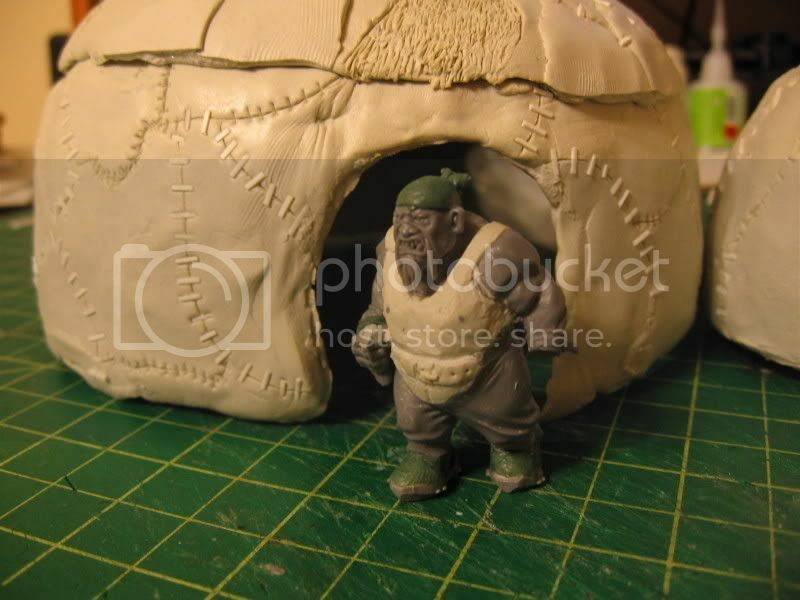 Hi thereThis article will be about my idea for Ogre hut with removable roof and accessible interior.You will need:- insulation foam- Apoxie Sculpt - some plastic bags- magic tape- plasticard or wire- knife - scuplting tool1. 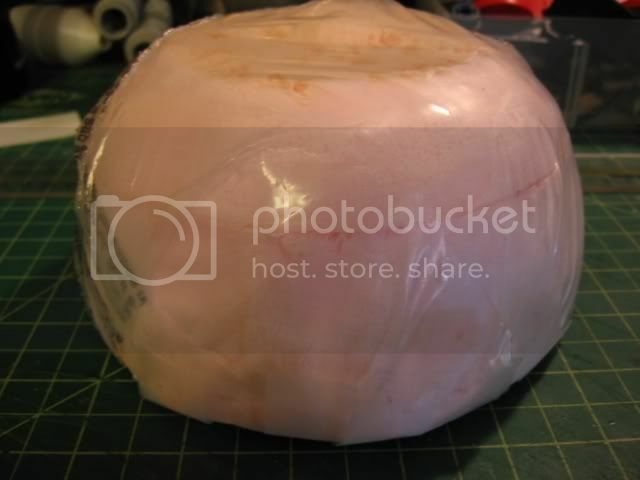 First cut your insulation foam to make 6" x 6" x 3.5" high block. 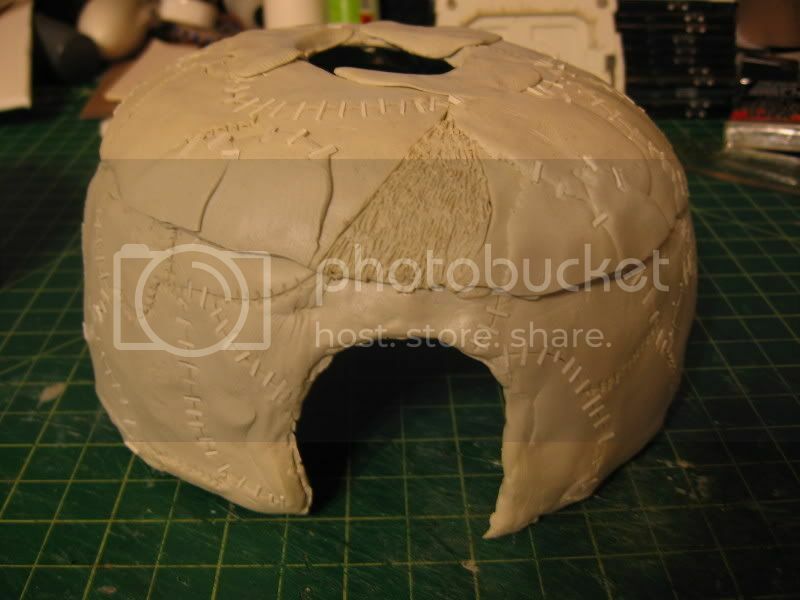 Cut it and sand it to make a nice dome like that on the picture below. 3. Start covering your dome with Apoxie Sculpt , spread it thin ( about 1mm) and work your way around to about 3/4 of the domes height. Remember to leave place for the doors. (From my expirience Make 2 thin layers, the first one as a base ( wait till it dry) and the second leyer for sculpting and modeling. One layer was too thin and the walls were breaking when I tried to remove it from the foam form. 4. Spread your second layer the same way that the first one. 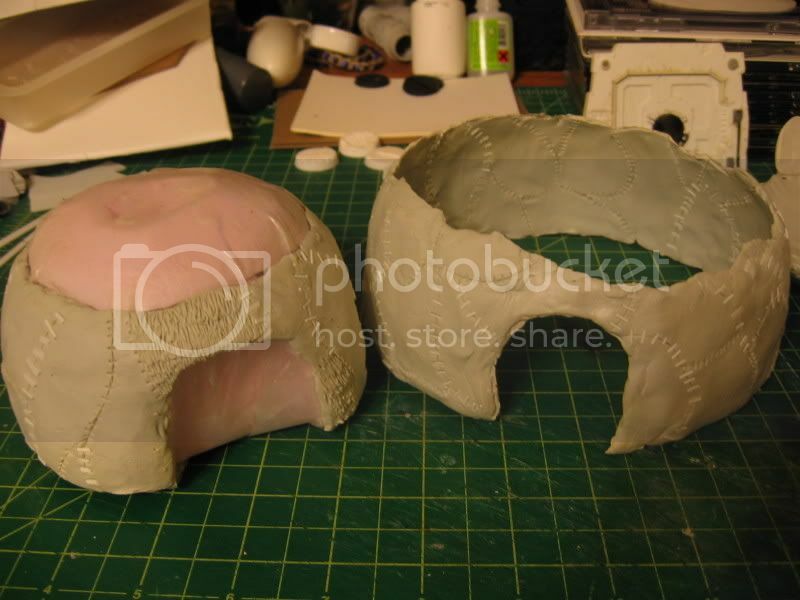 This time use your knife or sculpting tool to make lines between pieces of skins that are covering ogres hut ( read Games-Workshop article about ogre huts you can find some ideas for tha shapes of the skins). On some of the skins you can sculpt fur to make it look more interesting. 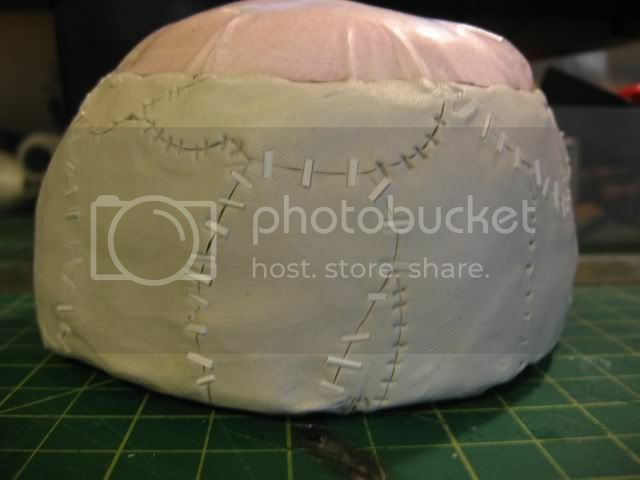 Like on the picture below you can use thin pieces of plasticard or wire to make stitchings. 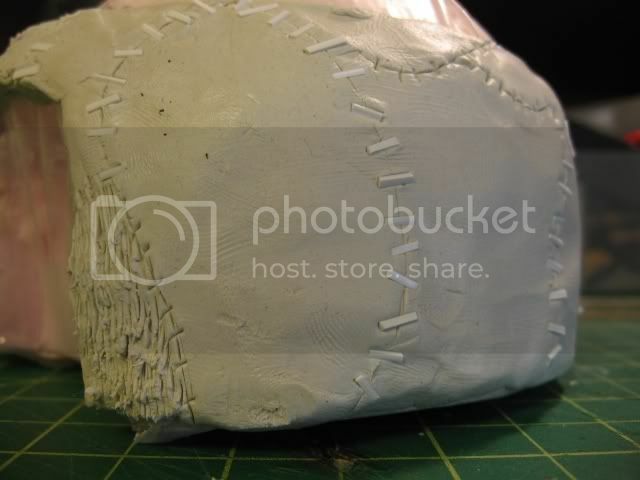 You can also use your sculpting tool and sculpt them yourself. 5. When its dry cover the top and the sides with another piece of plastic bag ( this layer will prevent your removable roof from sticking to your finished "walls". Strech the plastic again using magic tape. 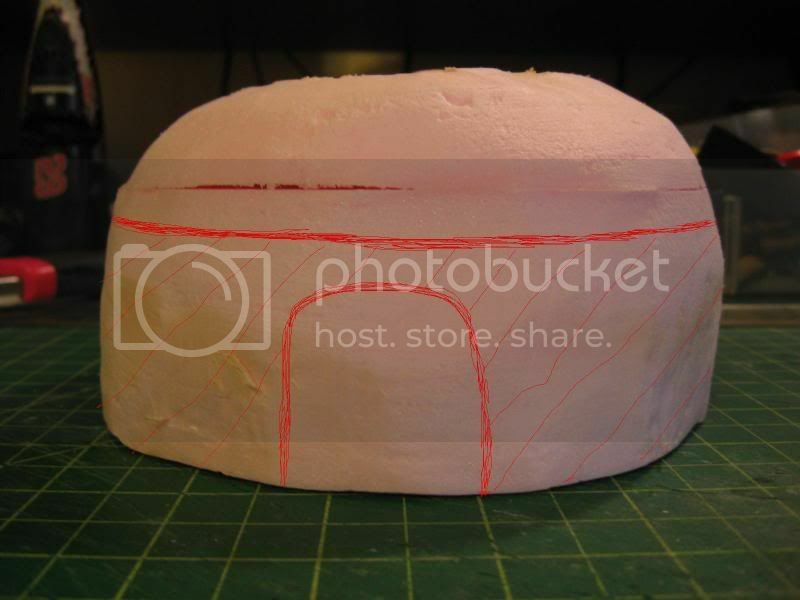 Again use 2 layers os Apoxie Sculpt to make the roof. The roof shoul be a little bigger, covering about 1cm of your walls. Don't forget to make a hole in the center of your roof to make a chimney for the fireplace. You got nice piece of playable terrain for you ogre army.Hope you enjoyed this article. I'll try to update it with finished photos of my painted Ogre Camp.P.S. You can use the same project to make huts for Orks and Goblins just build it in smaller scale. I really like this - a brilliant and effective way of adding something special to your diorama or gaming board. Well done.